“You know, I know of at least five guys back home who can do my job. Nobody can do yours except you. We don’t know what it is and you’re in there playing around with it like it’s your buddy. I’m your buddy,” says Rory Adams (Ryan Reynolds) to Hugh (Ariyon Bakare) who’s been spending way too much time with a new lifeform, almost causing a catastrophic accident on board the international space station in the sci-fi thriller, Life. The six member crew of the international space station has just made one of the biggest, most important discoveries in human history: the proof of extraterrestrial life from Mars. They’ve collected a new single cell organism and head scientist Hugh Derry begins studying it within the proper quarantine and safety precautions. As Hugh spends time with the alien lifeform, conducting experiments and trying to coax the living thing out of its slumber, it reacts quickly and violently. It’s not long before the crew realize the fast-growing and highly intelligent lifeform is a dangerous threat to them as well as everyone on Earth if it ever manages to reach the planet. The fight is on for the crew to work together to kill their discovery before it kills them and threatens life on Earth. Life is a completely unoriginal science fiction horror film that seems to lift most of its scenes and plot points from other great films. It’s Alien-lite with less gore and nowhere near as scary. The film does have a solid cast led by Jake Gyllenhaal as Dr. David Jordan and Rebecca Ferguson as Commander Miranda North. Gyllenhaal and Ferguson give the strongest and most emotional performances in the film as they struggle to save their comrades and fight the deadly lifeform. Ryan Reynolds is perfect as Rory, the outgoing, likeable engineer who’s the first voice of reason in dealing with the organism. Reynolds steals every scene he’s in including the scene featured in the trailer in which he goes up against the organism. Life suffers from a lack of originality in plot, special effects, and scares. As the alien grows, it begins to look like a distant cousin to something out of James Cameron’s film The Abyss combined with a squid. 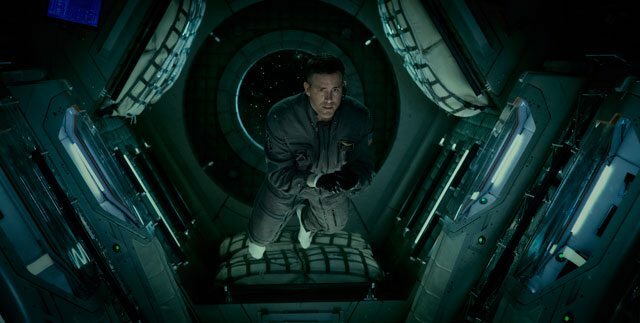 The spacewalks and shots outside the space station aren’t anything the audience hasn’t seen done better in other recent sci-fi feature films including The Martian and Gravity. Another major problem with the film is the terribly weak dialogue the actors are saddled with. From the painfully obvious, “It’s trying to find a way through the airlocks,” as the creature tries to travel through the airlocks, to the unbelievably dumb and groan-worthy, “It’s hard to watch people die,” the cast deserved better. Or, better still, the opportunity to show their talent by remaining silent and looking terrified. With a good cast but an unoriginal premise, unimpressive special effects, a monster that’s not very scary, and awful dialogue, Life is a subpar science fiction horror film that isn’t worth exploring.